What happens when memories disappear? Where do they go, and can we get them back? 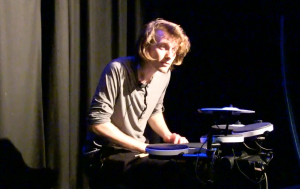 Using just his voice and a Roland TD-4KP electronic drumkit, Antosh Wojcik explores the effects of inherited Alzheimer’s on speech, memory and family. Poems become beats become glitches in time in a mesmeric display of live drumming and spoken word. On at Summerhall from 1st to the 26th at 10.15 in the Red Lecture Theatre.